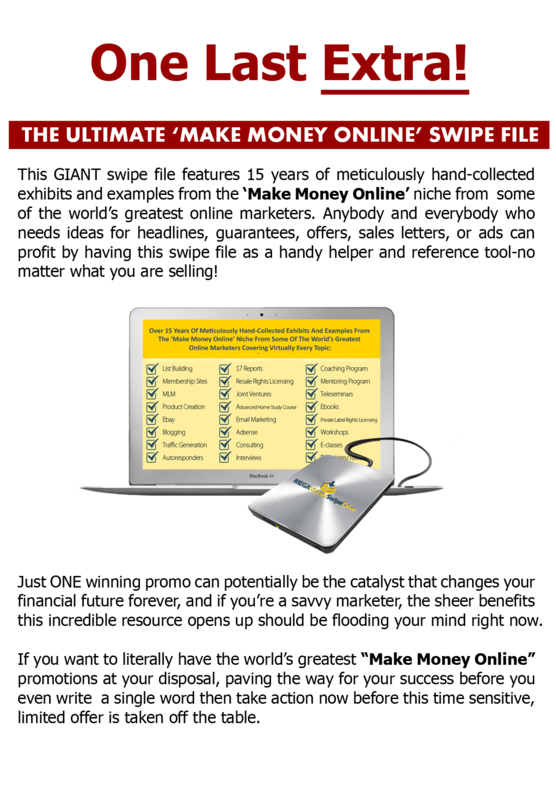 If you are serious about making BIG money in direct response marketing... you understand how important the proper "swipe file" is to your success. "Look- 30 days from now you can be nothing more than a month older- or you can be on your way to getting rich. You decide." Do you know how many times I've used this closing? About a dozen times. Do you know how much money those 12 ads made me? Well over $100 Million! The secret to making millions of dollars in this business is NOT reinventing the wheel. Millions are made when smart marketers borrow or even STEAL from other letters and ads that have already brought-in millions in sales. There's nothing more powerful than a winning combination of words that have ALREADY proven themselves successful. And Dozens And Dozens And Dozens More Ads And Sales Letters That Have Made Their Owners Mega-Millionaires! Basically- if it's a HOT market... I have at least a few ads and sales letters jammed into my Billion-Dollar collection! This is the same collection I refer to before I write even one word of copy for my $15,000 per ad clients. Now you have access to it all for peanuts compared to what other people had to pay! Here's how: If you want instant access to the entire Billion-Dollar collection, you're going to have to pay $97 Now... if you're a serious PLAYER- which I think you are- you'll know this is one of the best deals you'll ever come across. Over 70 ads and sales letters that have made over ONE BILLION DOLLARS in sales for their owners... over 700 pages... just $97. That's a great deal. But on the other hand... if you're a direct marketing "poser"...you'll probably think that $97.00 is a lot of money for some copies of sales letters and ads. ARE YOU A PLAYER OR A POSER? If you're a Poser... please stop wasting your time and close this browser at once... or give it to someone who can actually use it to better their lifestyle. I absolutely cannot stand pretenders! If you're a Player... you need to order this collection right now. I don't know about you... but it gets me excited when I hold a sales letter that made it's owner $50 Million or so. What I do is STUDY EVERY SINGLE FREAKING WORD OF THE LETTER! YEARS Of "Figuring It Out" Yourself! About a half-decade ago... I was in a real messed-up relationship. When I met her, I was on top of my game, I was 24 and a MILLIONAIRE! It took just 6 months for me to realize this girl was crazy. She made my life so miserable... it affected my entire life... including my business life. I made so many bad business decisions, I literally lost my fortune and I got down to just $5000 in the bank. I was out. Just like Trump in the early 90's. When he met Marla Maples and was getting rid of Ivana... he lost focus on his business and was almost forced to declare bankruptcy. I had to get rid of this girl... QUICK... and I did. Back In My Bank Account!!! Can this collection benefit you like it did for me? If you are any sort of a marketer, if you have products or services to sell... I'd say YES! Absolutely. 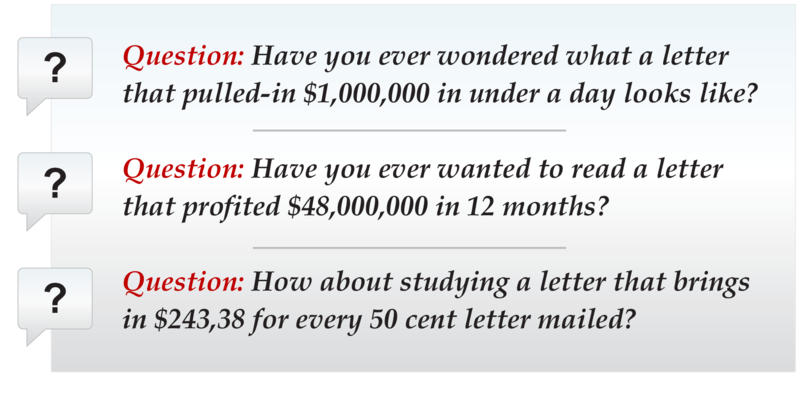 If you act now, You’ll receive my Million-Dollar sales letter and advertisement TEMPLATE. This is a “plug and play” template where you just insert your product into my proven sales copy and BOOM! You’ve got a $15,000 Vincent James-style ad or sales letter. Do you think I really start from scratch when I have to create a $15,000 ad or sales letter for one of my clients? Heck no. I’ve got this awesome little template that allows me to bang-out winners every time... like clockwork... with very little effort. This awesome template is now YOURS FREE! So, it's getting late here. It's like 2am and I need to go to sleep now. I just needed to get this all off my chest and I wanted to make sure you got this offer asap. 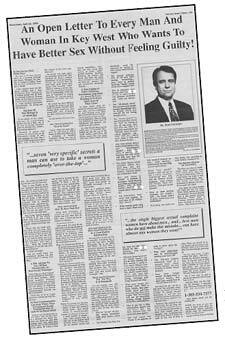 Again to get your very own copy of my Billion-Dollar Ad and Sales Letter Collection," you must act NOW. Do it now, before you miss out! Get instant access to my entire collection and bonus right away. If you can't "copy and steal" your way to riches... you may be hopeless. Author: "How I Made $77 Million In Two Years - And You Can Too"
PS: This is not a randomly assembled mish-mash of ads and letters. Quite the contrary. There's absolutely no "loser" in this 700+ page collection. You get a mountain of unstoppable promotional wizardry, the ultimate "swipe file" from probably the best copywriters of the late 20th Century. I’ve heard about “swipe files” before but aren’t they all the same? No. In fact, no two collections are ever exactly the same because swipe files are compiled by different people with varying levels of experience and for different reasons. It’s true that anyone could build their own swipe file. But it takes years of effort and a keen marketing eye to build a decent quality swipe file - let alone one that has collectively generated more than a BILLION dollars in sales. The “Billion Dollar Ads Swipe File” is a premium product because it only features ads and sales letters that Vincent James personally selected based on the persuasiveness of the piece and the results it generated. So what you’re getting are the hand-picked top performers as determined by the 77 million dollar man himself. Every ad and sales letter in this collection produced huge profits. All you have to do is learn from these examples and get a jump-start on your own super-successful promo pieces. How does the “Billion Dollar Swipe File” actually help me to build a profitable business? There are 2 major ways this 700-page resource center of massive moneymaking offers helps you: 1) It saves you hours of grunt work, slaving away on a keyboard hoping to come up with a winner and... 2) It saves you thousands of dollars every time you use it to create your own promotions instead of hiring a skilled copywriter. The Billion Dollar Swipe File features powerful, cash-proven sales copy. What Gary Halbert (one of Vincent James’ most cherished mentors) suggests is writing out an ad you like in long form - on a pad of paper. What this does is flood your mind with the successful psychology of selling. It gets you in the same mindset as the original ad’s writer. Actually, it even goes further. It places you inside the mind of the target audience so you can communicate with maximum influence. And that’s a key piece of the business success puzzle. Then, all you have to do is simply adapt these winners to your promotions. It’s a thousand times faster - and easier - than struggling to come up with the right words on your own. If the product is as good as you say it is, why is the price so low? This offer is strictly limited to the 5 days of our special promotion. During the 96 hours of our launch - and only then - you can purchase your own copy of the 700-page Billion-Dollar Swipe File for about ten bucks. But as soon as the launch ends, it reverts back to the regular price of $97. There are thousands of happy buyers who paid $97 for the exact same product. So, I’m sure you’ll be thrilled to get this discount. you could wait and buy it later. But that’s flat out just about the dumbest business decision any sane person could ever make. I mean, why pay more than you have to? It’s just ten bucks - so it’s something everyone reading this can afford. What you’re getting are some of the best, most attention-grabbing and persuasive pieces I’ve ever seen in over twenty years of collecting ads. And I’m so convinced that once you use this swipe file to create your own moneymaking promotions - you won’t want to part with it under any circumstances. It’s such a valuable tool that I wanted to change the stars and fortunes for as many struggling business owners and would-be entrepreneurs as possible. This is an opportunity that can literally change your life. Thousands of copies of the Billion Dollar Swipe File have been sold at $97. But it’s yours TODAY at a whopping 90% discount. It will be gone before you know it. So, you need to take action now before it’s too late. What makes the “Billion Dollar Ads” swipe file a “must-have” for anyone wanting to develop their own offers? It really boils down to wise decision-making - a key character trait of Vincent James and other trail-blazers. Passing up this offer makes no sense at all for anybody. It’s just ten bucks, for heaven’s sake. If you haven’t got the money - borrow it. But don’t miss out on one of the best offers you’ll ever find online of offline. What this tool does for you is it shaves years off the learning curve involved in writing sales copy. Instead of trying to learn “theory” - you get to experience persuasive writing from the inside - using dozens of pieces that have already generated fortunes for the companies and individuals behind them. Instead of spending years developing the craft of creating irresistible offers - you jump to the front of the line and gain a deeper understanding of the process. Then all you have to do is reshape your chosen ad or sales letter to fit whatever it is you’re promoting. For the price of a couple of Starbucks’ lattes - you can craft your first - or next - moneymaking offer, much faster and with greater ease when you have this powerful resource - the Billion Dollar Swipe File at your side. We only offer upsell products that are relevant, value-laden and profitable for our customers. So - yes, there is an optional offer for those who pick up the Billion Dollar Ads Swipe File. 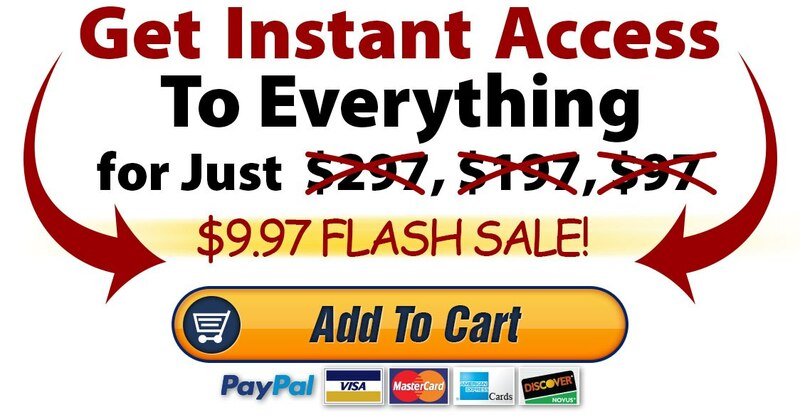 While this magnificent collection of market-tested ads and sales letters will get you up and running... wouldn’t it be extremely useful to also discover Vincent James’ total system of starting from scratch and building a 77 million dollar business in less than 2 years? You bet it would! If you’re fed up with where you are in life at the moment and you want more - you’re going to love discovering all of Vincent James’ secrets to building an empire from nothing but a pen, pad, and an idea. When you pick up the Billion Dollar Swipe package, you instantly qualify for a deep discount on the entire Vincent James package. In a nutshell, it’s the nuts and bolts story of how he went from nothing to 77 million dollars in less than two years - and more importantly, how you can too. You don’t want to miss this! More than 10,000 copies were sold at a much higher price when it first hit the market. But this SOLID GOLD program is yours at a deeply-discounted price. Plus, you also get 6+ hours of audio recordings featuring Vincent James and Russell Brunson, the 109-page PDF transcripts, PLUS instant Online access to “Becoming a 12-Month Millionaire”. This was an EXCLUSIVE one day workshop where Russell Brunson and his team of experts revealed how ANYONE can take a "regular" business and shoot it to 6 or 7 figures a year! Included is 8+Hours of video and the PDF transcript. It’s a complete package that will only cost you pennies on the dollar during this launch ONLY. If you’re serious about making more money - you won’t want to miss this jam-packed, yet bargain-priced upsell offer. Whatever you do - DO NOT MISS the opportunity to grab it now at a fraction of the regular price - or you’ll be forced to pay the full $197 later. Yes - absolutely! You are fully protected with my Love It Or Shove It Money Back Guarantee. What you are getting is instant and lifetime access to self-made millionaire, Vincent James' hand-picked collection of proven moneymaking ads and sales letters that have collectively generated over ONE BILLION DOLLARS in sales. That's 700+ pages of solid market-tested ideas responsible for creating multiple fortunes-all yours to legally "steal" for your own purposes – Go ahead and test-drive the entire program - swipe as many ideas as you want at ZERO RISK - for a full, 30 days. With my no risk, no hassle guarantee you have absolutely NOTHING TO LOSE. In fact, YOU MUST WIN - or your money is refunded - on the spot. I couldn’t make this any easier. All you have to do is step up to the order button and confidently claim your Billion Dollar Ads package today!